One stop on our journey through the altiplano (Highlands) of southern Peru was at Sillustani, a pre-Incan burial ground located on a peninsula of beautiful Lake Umayo. Chullpas—pre-Columbian funeral towers—were built by an Aymara-speaking tribe that dominated the Titicaca region before the Incas came in the 15th century. Ancestor worship was an integral part of the Aymara culture, and the cylindrical towers were built to provide a connection between life and death. Each tower contained the remains of one important member of the tribe mummified in the fetal position to recreate birth. The person was buried with prized possessions to take to the next world, a custom still practiced by the Quechen people today. The engineering involved in their construction is more complex than anything the Incas built. Ramps were needed to raise and set in place rectangular blocks and stones, a very ambitious project considering the time frame. 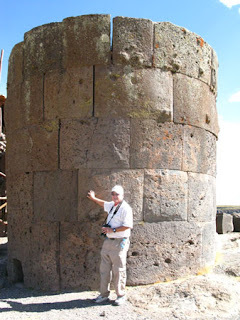 Other sites with large round tombs have been found across the altiplano, but Sillustani is the largest and most significant. Grave robbers have destroyed many tombs, and others were left unfinished. Many are being restored under the current effort to preserve this ancient heritage. Our guide Aidee, a native Quechen now living in nearby Puno, told us that Sillustani is currently under the auspices of the National Cultural Center, which is protecting and upgrading the site. A large decorative stone plaza leading to the tombs has been built within the last two years. 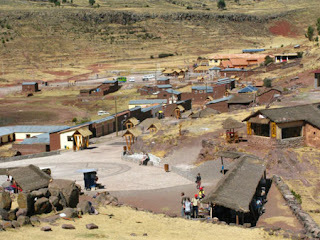 To access the tombs, we walked through small village of about 100 people on the one paved street. Children returning from school chased frayed balls, their only playthings. From the street we crossed the plaza at the foot of a high hill overlooking Lake Umayo (which ultimately flows into Lake Titicaca). Two natural islands rose in the crisp, blue water of the lagoon, creating a lovely backdrop for the perfect burial site--high on a hill and with easy water access (a laundromat for local women). We walked up the hill to the first two round tombs, built with a small entrance and double dome inside. 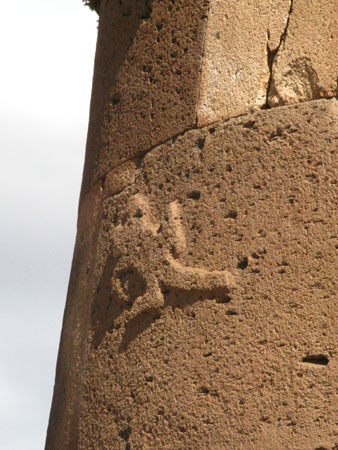 Symbols such as a snake or lizard, considered a symbol of life because they could regrow their tails, were carved on the outside of some tombs. One large lizard tomb is beyond repair, however, because many of its rocks have fallen, and further destruction might result if it is tampered with. Speculation is that it might have been too heavy at the top, or perhaps an earthquake caused it to break. 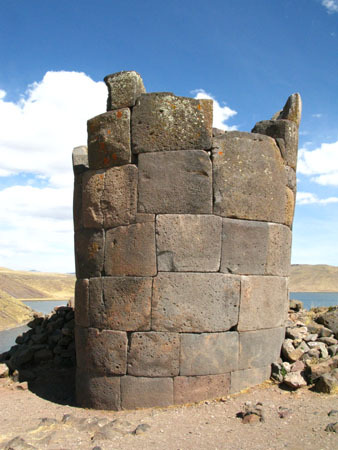 A visit to Sillustani previews pre-Incaculture—and (perhaps inadvertently) shows how small the contrast is between ancient days and contemporary life in the mountainous rural regions of Peru. Starting to design my tomb now...don't go out of this world silently. btw - loved the article!